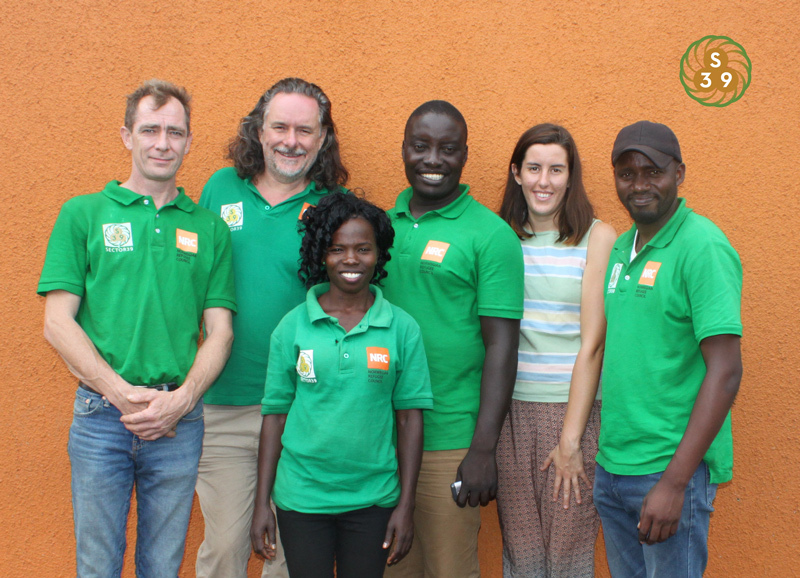 June to November have been a momentous time for our training teams here in Western Nile. In just 6 months we have been tasked with the challenge of introducing permaculture methods in this untamed region where refugees greatly outnumber the indigenous population. This first interview is with NRC translator and host community member Julius, he has fully involved himself in the project although he wasn’t present at the initial training. He makes some very perceptive observations about the impact of the project and has taken on many of the ideas and insights himself as he can observe them working effectively. This 2nd video with one of the members, Opio Grace is very revealing and worth listening to. I left in the local language as well as the translation (translated section from 2:10) as I wanted to share her voice as well. It is clear that permaculture has had a significant impact on her life in just 6 months. Zone 4 BididBidi have the aspiration of securing a 2 acre plot to develop a permaculture enterprise and demonstration center. The map below is the product of group discussion and consultation over several days. We have already worked together to create a small training plot right next to the church we have been using as a class room. We would hope very much to have the opportunity to support these pioneers over the establishment phases of this project. Much elation on completing the training, hopefully just the beginning of much bigger things to come. This audio track is a presentation from the members design team which focused on building and the carpentry skills as an enterprise within training centre sketched above. Proposal: This project would benefit from support for a minumum ofr two years. 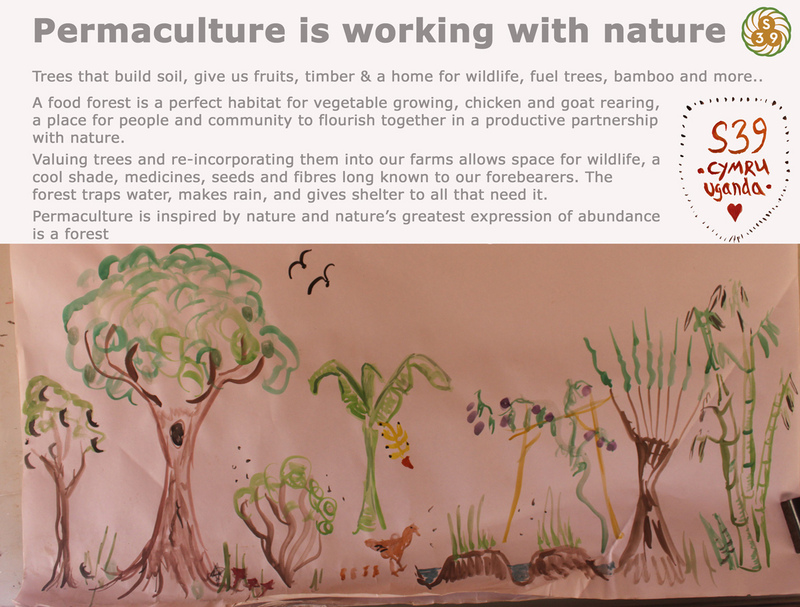 – ambition is to establish a permaculture training centre which will will transition into a stakeholder owned and managed fully independent enterprise. – exploring a training and Enterprise development model that can be self replicating and able to generate much of the resource need to sustain from within its own internal economy. The vision is to work closely with the members from the training to create a new and wholly refugee (stakeholder) owned enterprise that will serve as a permaculture training and demonstration hub for the region. It would incubate several related enterprises that initially would be the service providers for the training centre. Nile region, developing many of the resources and skills needed to create a shift in the prevailing methodology for food and livelihood security. Permaculture and refugees initiative is a Norwegian Refugee Council funded project, led by Sector39 training team. 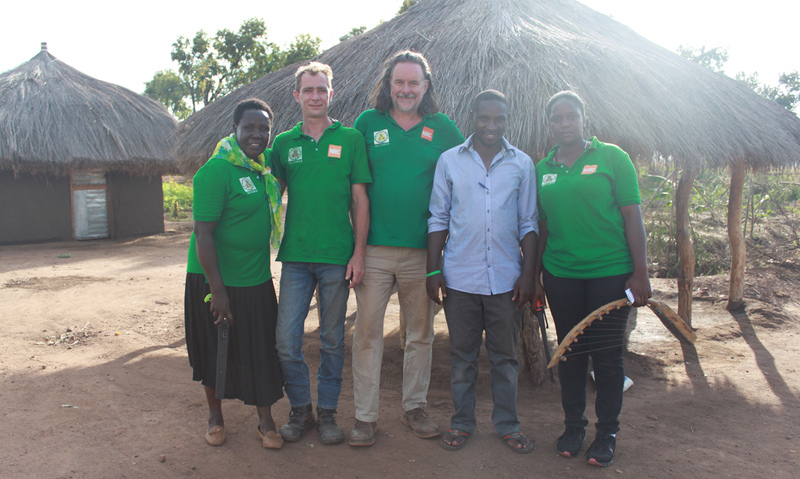 Images from the third Action Support visit to the Maaji region of Northern Uganda. 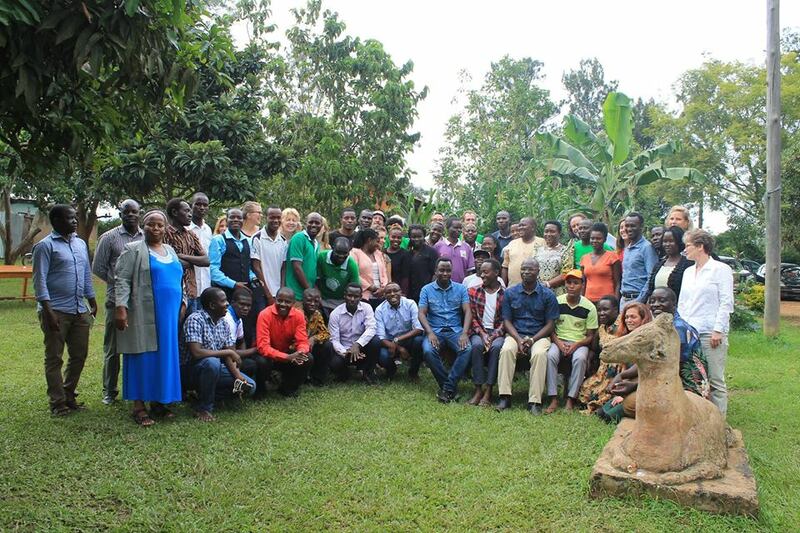 Sector39 led on the training for these settlers Uganda; in return for training and in field support the 20 participants are preparing to work as outreach permaculture trainers for the their region. Each has the target to reach 5 more individuals in the region and to support them to set up their own training and demonstration plot to support the uptake of permaculture design ideas and techniques. In support of this work Sector39 are developing a training manual that focuses on the Holmgren permaculture principles and ethics. Permaculture is a design system for solving problems, not a set of techniques to be blindly replicated. We hope that individual trainers will learn how to adapt ideas to fit individual circumstances. So far there has been a great deal of enthusiasm for the work and many participants have already been successful in reaching out to and recruit the net tier level of trainers. Here is the first draft version, we plan to translate this into 5 languages. This is a new approach to training in these circumstances. The intention is to create pathways from reliance on external aid donations to resilient communities meeting much of their own needs from local resources. Great to see progress at Maaji refugee and host community settlements. Of all the permaculture related innovations we have been developing and demonstrating and for good reason, the energy efficient stove has proved the most popular. Here is a narrated slide show of progress from the second week of in field visits following on from the June 12 day permaculture training provided by the Sector39 team. Permaculture is a different way of thinking. It helps us see the bigger overriding patterns. Life is complex, we face complex challenges, permaculture builds on common ground and common experience. It is very powerful and it works. Never forget that we are all people, we need each other for survival if nothing else and we are connected together by food and our connection to the soil. Microbes and mycelium run his planet as they connect everything else together. Personally struggling a bit to get back on top of things. really tired and running on empty but that said is because i put 100% of myself into these things – because that is what it takes. i will be fine, only been here a few days and had to go straight into teaching and funding reports back logs. back 7 days and 6 of those have been work days and the other a work day missed because i was asleep all day. normal service will be resumed. BUT, WOW, thanks for putting it so well Angie, we delivered a top rate PDC took many unanticipated challenges in our collective stride and came out not bankrupt, which was a real possibility a couple of months prior to start as the fundraising had been less successful than I had hoped and literally the last pot of money to come in, like Sisters Carbon, Angie etc really saved the day. The convergence actually made a profit. I have $400 us dollars at least from that for reinvestment. more but we haven’t done the books yet. The EA convergence was totally shambolic and revealed many flaws and oversights in our planning. Luckily none of this mattered, no one noticed except for us, mainly poor Helen, BUT, it was a really successful event and one that vastly exceed my and many other’s expectations. Maybe if there was one thing Helen hadn’t realised was after all this is Africa and everything is shambolic most of the time anyway.. so people are patient and easily pleased by what does work and dont worry about all the things that didn’t. The quality of the conversation around the edges and the networking made alone it a run away success before the first PowerPoint show or bed bug bite. Everything else was a bonus and people really loved it and were and are buzzing since. We should all feel really proud of what we have accomplished at Ssanje. I see Charles and team are keen to follow up withe Dec course at Sabina so I hope also what we have done there will create momentum of the school. Of course a PDC is about the participants not the venue.. and there were many complications arising from the blurred edges between course and venue. I am glad to see Charles is working there again, i wont be hurrying back for my own reasons. but it is important to build on what is there. The contrast that really brought things into sharp focus, was working at the Vocational Skills Training complex in Adjumani. It was just a compound of about 4 acres with a series of simple buildings, designed and built as an adult training center. the catering was by professional caterers , on a three stone fire as ever, but the food was cheaper and far superior than at Ssanje and the prices are 20 or 30% higher at the refugee areas. We had 2 sodas a day, 2 waters each, choice of 3 meat and 3 veg dishes and everything worked because there was an onsite team whose job it was to make things work. Logistics people in back up. it was a very different experience. It really underlined how much of the venue management responsibilities we had to take on at the school. We taught 42 refugees who between them spoke 8 languages (we even added a little welsh seeing as everyone else seemed to have their own language) . It was more like 50 or so, we had 2 simultaneous translators and everybody worked it out between themselves. made it very slow. but boy does that focus you on what is the key content, no amusing anecdotes and no videos really as it is all too slow. I showed 10 minutes of Geoff Lawton soils the intro bit i always show to start the conversation on souls, with translation and discussion that took 45 minutes ad we only had 2 1/2 hour classroom time am and 30 mins pm. many did not read or write. we had to invent everything about how we teach. The team were so great, Han earned hers stripes and Grace did so much of the front-line contact time; holding the space and Han especially got to know all the people very quickly. A big unfamiliar group became a family before our eyes. it was truly amazing. Paul Ogola gets a special mention from me, great teacher, calm but forceful,. very good at getting people into action. We were all good so maybe it is unfair to name check anyone, everybody did so well.. Not least because it was hard, we had to think on our feet and we delivered a life changing experience for all involved. You have to understand the drivers, people hired by NRC to drive the buses around attended the course and took notes. so did the translators, when they weren’t translating. The center staff and manager also took part and apologized and asked for a recap if their job had taken them away for a session. It changed the ethos of the whole centre. actually it gave them an ethos because all they had ever had before was a budget. The kitchen crew will use the energy efficient stove we built for them, the compost the water recycled.. it was like the whole compound suddenly got permaculture in one collective realization. It is a changed place, for once everyone is in agreement. Permaculture really works, it buts priorities in the right order to think about things in terms of opportunists rather than limitations. Although the setting and format was different, the Ssanje course set us up perfectly for Adjumani course. we did 16 practicals, all rehearsed and tolled up and we didn’t fit everything in that we could have. it was all learning by dong the classroom sessions were either explaining water filters and swales or they were a closing plenary when i related what we were doing to the principles and ethics. it really worked for them, they really got it. we also really hit on a good idea fo rthe designs. 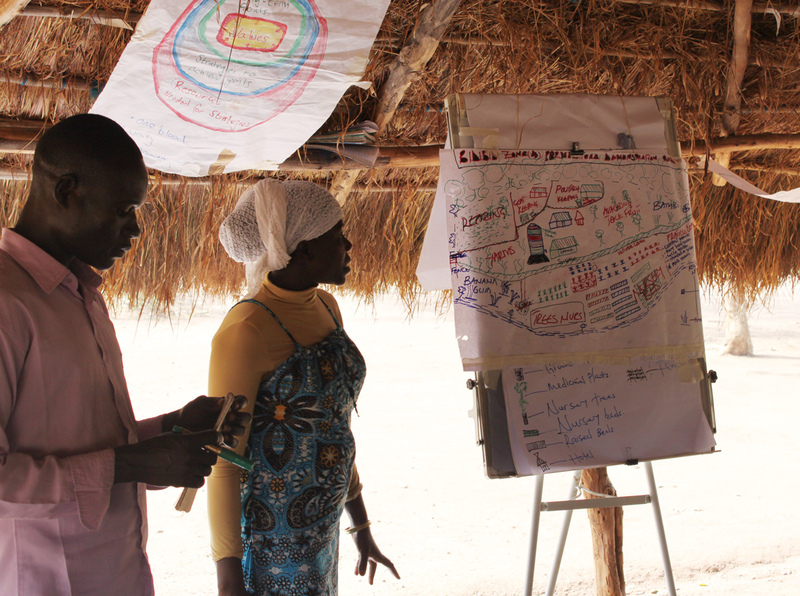 Instead of trying to teach SADIMET to a bunch of semi literate cattle herders (and a vast assortment along side) each participant worked on their own personal action plan. 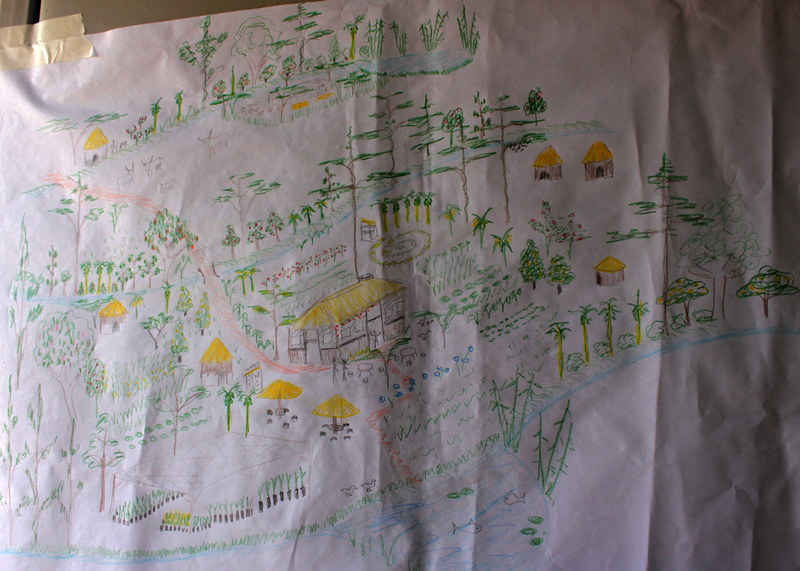 so the design was on themselves and how they were going to bring permaculture into their respective communities. Each participant will be incentivized to train 5 second tier trainers, through our on going support. so what comes next is 6 months of hard work, 2 of which will be back in Uganda, maybe a trip to Zimbabwe to network, who knows… but we have a contract signed with NRC worth US$55,000 that’s going to get burnt up pretty fast but we can create real momentum with a budget like that over 6 months. we are going to get good value from taht money for sure. Watch this space, tell me how you want to be involved, Everyone who was at Ssanje and Adjumani is in for the longer term as far a I am concerned I think a few us learned what our strengths and weaknesses were, but that is why we came with a big team. we must not lose the great value of learned experience we created there. Jagger is keen for us to do a PDC in Kumi and I see why as they have a really active core team there already. I see a real value in creating clusters in places where people can support each other and build projects rather than just sending loads of loan rangers out there. Permaculture needs nurturing especially in the early days of a project or a career, we need to support each other better. and build that into the overall strategy of what we are doing. I would like to do on on Mufangano island. Those who remember George and Bernard, two teachers who came for the pdc all the way from there and could only stay 2 days as there school was still in session. I will explain why i think is a great opportunity another time, but yes it will need planning and an advance team to go there and report back. 20 months away that one i would hazard a guess, plus no idea how to fund it.. but its a community of 12,000 people on an island. a place where people really understand limiting factors and finite resources. The 2 guys who came are both headteachers and community leaders.. we could reach the whole island through them, create a mini permaculture nation.. i am serious it could be really significant/ I see it as such anyway. But reality will kick in, it will be a challenge, that said it is not far from Kisumu, 2nd city in Kenya I think its a significant place and Paul Ogola and his mates as well as the islanders all speak the same language, Luo. All of these tings work in our favour. So i want us to find ways to make that happen. My greatest joy is to see progression in individuals S39 team members growing as people or getting to know each other better, but also seeing the course participant blossom into great teachers.. I remember writing some of these objectives on the first funding application 3 years ago, What a thrill to see it happening before our eyes. Well done, I love you all, new opportunities will come from this! I want to thank you from the bottom of my heart 😍for being such a fantastic teacing & support team. Everyone made my job so much easier by being willing to step up to challenges (even before we arrived!) – whatever I/we threw at you and you all went the extra mile whenever needed. Added to which your humour, friendship and acceptance of my limitations, as well as helping me with all the planning beforehand, all made such an incredibly memorable and fulfilling first time for me in Uganda. My fears were dissolved once I’d arrived and I hope I was able to give my best too – at least most of the time!!! Jane Vetiver wants to finish her PDC with us and Steve suggested she could do this on line. I’ve spoken to her and am happy to send her the presentations but she may need some support – and certainly Steve will need to talk through his plenary presentations with her. We discussed her aiming to do one of the principles per week (7-12 which she missed) and she’s keen to do a design for her mother’s land. Question – if i forward the presentations to her, would individual teachers be up for dealing with any questions relating to your sessions please? This could be by email or Skype, for example. Steve – are you happy with this approach? PS it’s as hot here as Uganda so I’m pretty acclimatised already! Much to say about refugees. Team Nyumanzi, host community, refugees, trainers, we are all one! Someday we might all be refugees, how we treat them is how we wish to be treated. Resource wars, climate change, collapse of the old economic order.. we would be foolish to think we are immune to catastrophic change. If displacement were to come to you then you could do a lot worse than arrive in Uganda. The Central African nation has accepted over a million displaced people in recent times, putting many other nations to shame. International agencies have stepped in, UNHCR, Norwegian and Danish Refugee councils are visibly engaged, but it is the Ugandan government and people that has extended a welcoming hand by releasing land enabling the refugees to become settlers. I first became aware of the enormity of this situation in a BBC Radio broadcast ‘Crossing Continents’ maybe a year ago, highlighting the crisis. Congolese and South Sudanese people have been pouring across the border in search of refuge in huge numbers. Experience shows these awful situations take time to resolve and by that I mean some years. Boredom, depression, loss of hope and human violation follows in the tracks of hopelessness, there is a great vulnerability and need for constructive action; so turning camps and places of containment into settlements and places of potential is a significant step forward. Uganda is showing great compassion to its troubled neighbours, not only have the new settlers been given ID cards and land they are also being offered vocational training and that is where we come in. AID agencies tend to work in departmental bunkers. Roads. Water and sanitation. Farming and enterprise. Education. Housing. Energy. There is little cross departmental strategy, so to even think about Permaculture in this context is an almost heretical departure from the norm. Houses catch water, waste becomes compost, roads channel surface water in a way that can either accelerate or slow soil erosion. Tackling food and resource issues through community engagement is education, so to my mind Permaculture should be at the heart of resettlement and enterprise development, especially in these fragile spontaneous communities. I heard that radio 4 program and realised the huge potential that was being overlooked but how was I to capture the attention of these huge NGO’S? I fired off a few emails to no response. After all Sector39 is a tiny training enterprise in a little Welsh village, hardly well placed to win the attention of international agencies or equipped to work at such scale. Chance is a strange thing and it turns out the head of the Norwegian Refugee Council’s African operations did a Permaculture course in Wales 12 years ago. S39 began teaching PDC courses in Uganda after a 2014 study tour here visiting innovative farming projects with a local Welsh farmers support Charity, Dolen Ffermio. A course graduate and friend from our 2017 PDC attended a conference in Nairobi this January and whilst at lunch permaculture quickly came up in the conversation around the dinner table between my friend and the woman seated beside him. Turns out the lady concerned was operations director for the Norwegian Refugee Council Africa and they both knew me as their permaculture tutor. She announced that there was growing interest in permaculture as a strategy to develop community resilience in the settlements where they are working. She remembered me well and through my friend invited me to get in touch with the Uganda program director who was also keen on Permaculture. I was coming to Kampala in February already to speak at the university and to prepare for our next PDC here in May, so I agreed to meet the Uganda project head and on arrival they immediately whisked me off to Bidi Bidi, currently the world s largest refugee settlement. They couldn’t offer me the work directly as it had to go out for competitive tender but I drafted a training program and budget and in April was invited to submit a bid. I gather there were 100 applications from all over the world but we did win a 6 month opportunity to pilot a permaculture for refugees program that hopefully might become a template for future work. An amazing opportunity for Sector39 and permaculture in general. We started training 40 participants from both refugee and host communities plus staff, whereby each participate would in turn be expected to train and support 5 family groups. I write this as we speed home along bumpy roads, crossing the mighty Nile en route having completed 2 weeks of the phase 1 of the training. It has gone well. I am humbled and honoured to have worked with these people. Everything I ever thought about refugees has changed. The dizzyingly huge numbers turn people into statistics. I couldn’t really imagine how to find common ground with cattle herders and subsistence farmers from Central Africa, Maadi, Dinka, Kakwa people speaking languages I hadn’t even heard of let alone had a grasp of. Through simultaneous translation, demonstration and the magic of permaculture we have found a common language. We have become friends. True connection has been made. I look forward to returning in September, we will give active support in the interim but as we part I can say my new friends and colleagues are inspired, empowered and ready to lead their communities. I will genuinely miss many of them and I know the same is true in return. Through our own needs, food, soil, energy, enterprise and design we all have much more in common with each other than we realise and the differences are trivial and are what keeps life interesting. Permaculture unites us. Peace. I have much more to say.. And will do so over coming days. Refugee Project: Norway, Wales, South Sudan, Uganda. The beginning of our journey to the North! We had to stop off in Nateete, a satellite town of Kampala. Of course we couldn’t pass by the city without a visit Ali’s budding urban permaculture project which is working with local youth groups to regreen Nateete town with flowers and trees. Although we couldn’t stay for long, Kampala was hot, busy and we had a long journey still to go. We travelled around 5 hours into the night to our next location, losing a sack of t-shirts off the roof along the way! In a pumping Saturday night in Gulu, we picked up Vicky Akello, a permaculture graduate from our 2017 PDC in Kamuli. 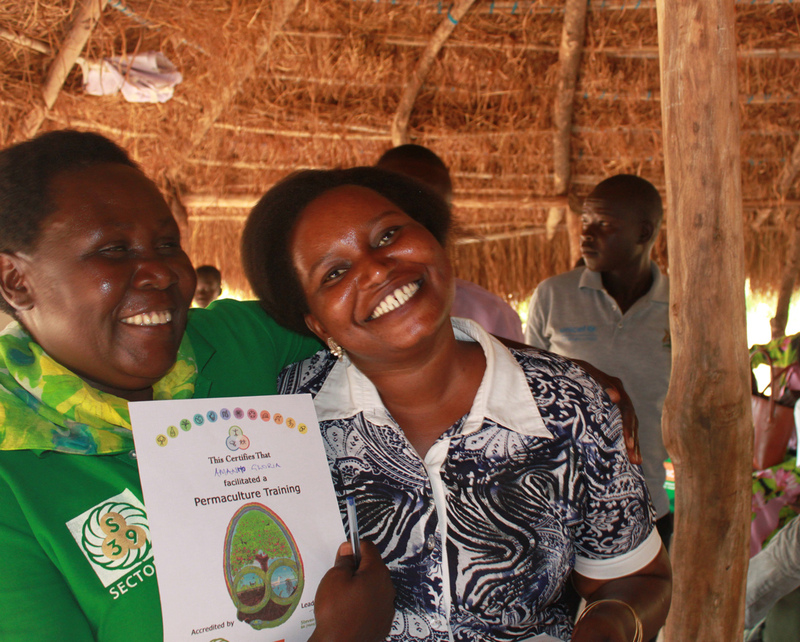 Her work since finishing the PDC with farmers in her area of Gulu has been impressive so she was top of the list of people to add to the team. We grabbed some ‘Chips Chicken’ and chapats, heading further North on progressively bumpy roads! By midnight we were rally driving over bumps and potholes nearly at our final destination after 11 hours of travelling. We arrived in the town of Pakele, at 1am with the place still full of young people getting late midnight snacks. The next morning we found Pakele is bustling town full of street food stalls, clothing shops with fashionable wears from Kampala and small shops containing sweets, mandazi and lots of beans! The town had a lively feel and felt very different to the region on Kyotera in the south West. There are many aid and NGO agencies here, UNHRC, Danish Refugee Council and World Food Programme to name but a few. There are lots of hotels and guesthouses that reflect the comings and goings of aid workers in the area. In the area of Sanje people were speaking only English and Lugandan and some Swahili, but in Pakele there are around 6 different spoken languages. The team is already learning some few word in Ma’di which is widely spoken in the North West of Uganda and also in South Sudan. On Sunday we rested, recovered, acclimatised to the extra 8 degrees of heat and then got to work planning for the following weeks’ trainings.